Nestlé through its MILO brand, has unveiled a web-based nutrition calculator to help foster healthy nutrition among kids at a time when health statistics indicate that obesity rate in both private and public schools may be as high as 50 percent among kids between ages six and 12 in Kenya. 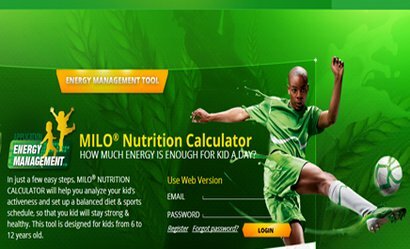 Dubbed MILO Nutrition Calculator, the tool is designed for parents of kids between ages 6 to 12 and allows them to track and monitor their nutrition intake in every day’s serving. The web nutrition calculator enables parents to calculate the nutrition component of their kid’s meals, analyse their activeness, set up a balanced diet and schedule their kid’s sports activities by just a click of the mouse, on their web-enabled phones, tablet or ipad. The application is currently available as a link on the website and as a widget. The application will not only enhance nutritional awareness but empower mums and caregivers with information to make better nutrition choices to help their children grow strong and healthy, according to Diana. Hey,maybe you should see the 2nd half of the trailer which has singing fruits & veggies in a happy musical format. Hundreds of kids in SoCal schools and/or libraries have enjoyed this health musical -- if demonizing "junk food" in a unique way causes you to be "creeped out", you're in the minority & lack a sense of humor. Thank you so much! !